The Bossltg 50 FOOT 25KVA PORTABLE GEN-SET LIGHT TOWER COMBO MH LIGHTS was designed for construction projects that require multiple voltage, 3ph/1ph capabilities. The need for 3ph power for electric motors, sub-pumps, large heaters, and welding machines; Plus, 1 phase 120v GFCI protected electrical voltage for power tooling for remote area construction apps. Included with this versatile product is a 50′ Electric telescoping tower with 8 x 1000w METAL HALIDE floodlights. 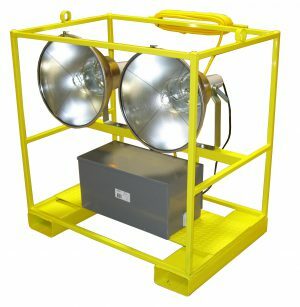 This high output of light will illuminate 25 + acres and project over 250′ @ 180* beam spread or 200′ @ 360* fixture positioning. For remote areas an Environmental fuel contain cell comes standard under gen-set package. Fuel capacity designed to operate gen-set for 24 hours without refueling. 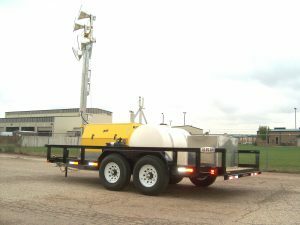 This Trailer mounted Bossltg Combination gen-set light tower is perfect for remote construction projects. 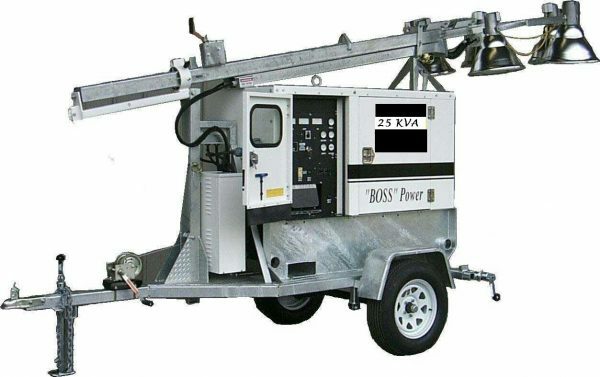 The Bossltg 50 FOOT 25KVA PORTABLE GEN-SET LIGHT TOWER COMBO MH LIGHTS is equipped with a 25kva MQ POWER Water-Cooled Diesel with Engine safety shutdowns. Quiet type Muffler. Sound Attenuated weather tight enclosure, 12 volt electric start. Switchable voltage to include 480v or 208v/120v 3ph and 120/240v, 1ph. 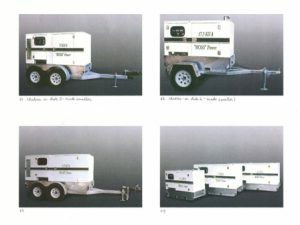 25kva/17kw Generator. Analog full instrumentation controls, Electrical Distribution panel with 2-120volt GFI Outlets, 1- 30amp,125/250v receptacle and 1- 50amp 125/250v Spider Box Receptacles. 8- 1000w METAL HALIDE Floodlights, 50ft. Electric Telescoping Tower. Heavy gauge Steel Trailer Frame,1x7200lb rated axles, 16 inch radial tires with white spoke rims and Powder coated Fenders. DOT towing package with electric brakes. 50 FOOT 25KVA PORTABLE GEN-SET LIGHT TOWER COMBO MH LIGHTS light towers are used when both floodlighting and gen-set utility power is needed during night tower working conditions. This package is perfect for oilfield guard shacks and office trailers. Capable of supply power to operate entire office equipment, air conditioners and heater systems, refrigerator and computers. 8 – 1000w METAL HALIDE floodlights to project light 360* around office guard complex. For the cold winter months gen-set sized to supply heaters to porta cans for site personnel. OPTION: Bossltg can supply GFCI 120v distribution panels, Part#MPP6-120vGFCI, that plugs into the 50amp California style spider receptacles and can expand your 120v outlets to 12 addition plug-ins per panel. These power panels are designed with magnetic frame so to attach to gen-set housing. Clients can plug in three of these panels if required. NOTE: Bossltg is a UL1640 Certified Electrical assembler that can design special power panels to meet clients requirements. Bossltg Gen-set Combo units can be used as a stand alone Contractors Power Supply or a Light Tower System, separately.